International Buyers - Please Note: Import duties, taxes, and charges are not included in the item price or shipping cost. These charges are the buyer`s responsibility. Please check with your country`s customs office to determine what these additional costs will be prior to bidding or buying. 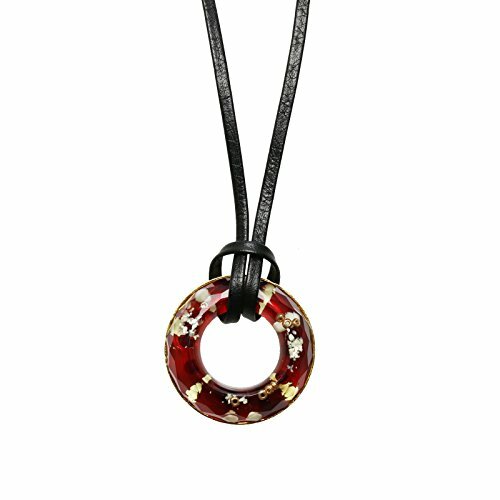 It is an eyeglass holder using resin parts of "New Candy Series (Red)". Please use the glasses hooked on the ring part. You can use it as a necklace without glasses. It is very convenient because you can adjust the length freely by sliding the clasp. It is lighter than it looks and the necklace should be tried if you feel stiff shoulders. Because it is a strap, it is also recommended for those who are allergic to metal. Corresponds to the width of temple (arm part of glasses) 1.6 cm or less. The main parts:epoxy resin, metal: 24k gold plating copper and brass, leather, diameter 3.3cm, total length 64.5cm, It corresponds to the width of temple (arm part of glasses) of 1.6cm or less.